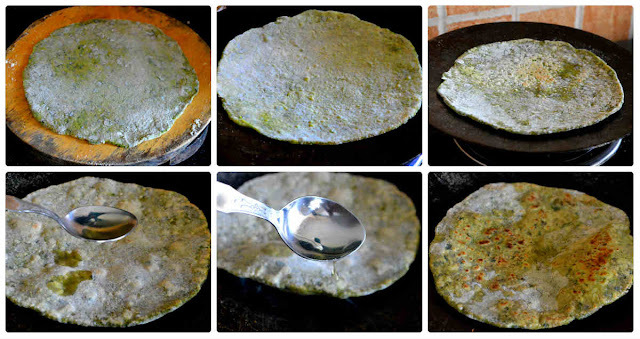 Palak Paratha/Spinach Paratha can be quoted as "tasty and nutritious" Paratha. 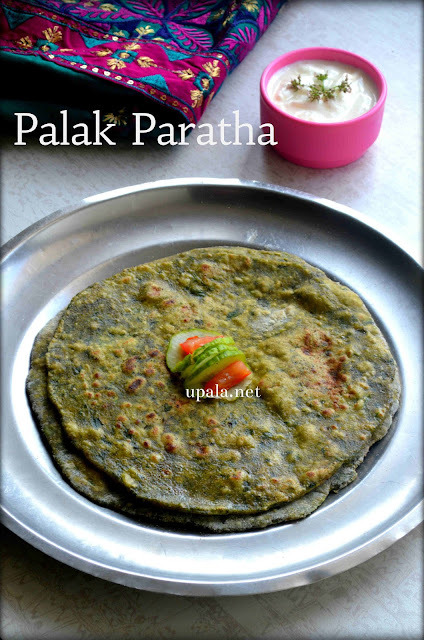 This Palak Paratha recipe is quite simple and even new to the kitchen can prepare it in few minutes. In this recipe, I have finely chopped the palak leaves using my hand blender and mixed it to the atta to feel the palak chunks when it melts in my mouth. If your kids don't love this way, you can either blanch and prepare a Palak Puree or prepare puree without blanching by using raw leaves then mix with atta. Being an ardent fan of nutritious food, I love to use the fresh palak leaves instead of blanching and using it. 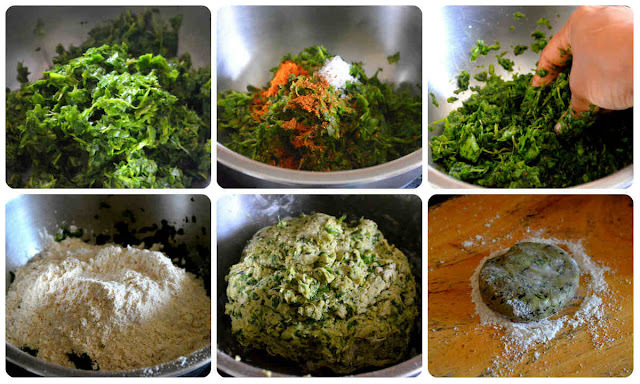 1) Take a mixing bowl and add finely chopped palak, red chilli powder, salt and Garam Masala. 2) Mix them well and set aside for 5 minutes. 3) Add the wheat flour and start mixing to make a crumbled mixture. 4) Start sprinkling water and knead it to form a soft pliable dough. It should neither be too hard or too sticky, and the correct texture of the dough is soft and nonsticky. 5) Divide the dough into equal sized balls and roll each one between palms to make a smooth ball. 6) Take one ball and roll it over wheat flour, keep it on the rolling board. 7) Roll the ball to a smooth circle by dusting wheat flour when required. 8) Heat the tawa and place the rolled palak paratha over it. 9) Once you see the bubbles popping up on the upper surface, flip it around to cook the other side. 10) After the other side is half cooked, sprinkle oil on sides and leave it for few seconds. 11) Flip again, leave it to get cooked for few seconds and remove from tawa. Yummy and healthy Palak paratha is ready...pair it up with curd and pickle. 1) Generally, for any paratha you leave it to cook for a longer time before drizzling oil and once you drizzle oil don't leave it to cook on tawa for a longer time. Let it cook for few seconds and remove from the tawa. 2) You can even add finely chopped green chilies to this paratha.